I got the fancy shoes instead of the jacket lol. I picked up a bunch of Carrara stuff and put Provence on my wishlist. 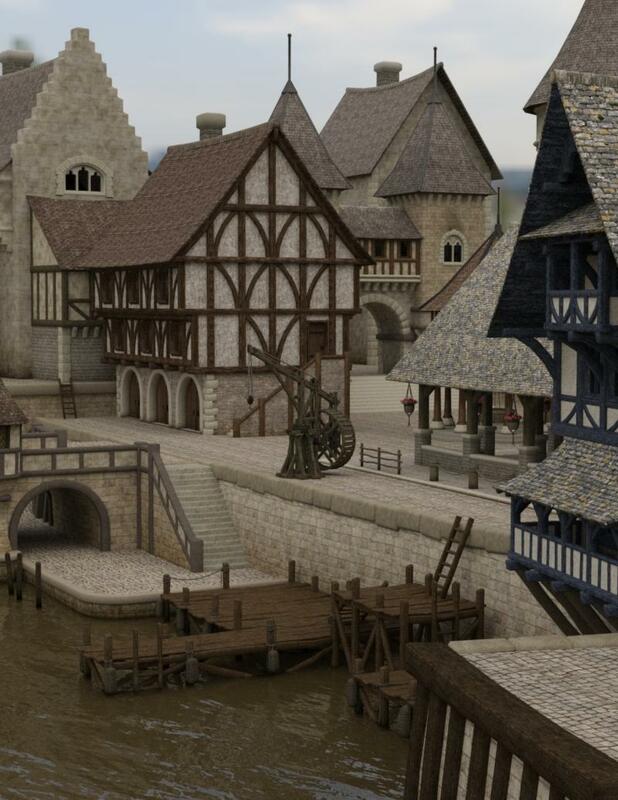 I have Medieval Docks, but haven't used it yet. It looks gorgeous though. The shoes were my other choice. I'll see if I can do a render from the docks. At first glance, it seemed a little washed out, but that was probably my lighting. It's been a long time since it was posted in my thread, so let me mention it to you- if you render any of Faveral's sets in 3DL, use Progressive for the rendering to get the water looking just like the promos. (Lake Village) I tried a Google search but can't find the post. It was back in or before 2015 as I found a post referring to the post. Faveral was nice enough to come onto my thread and assist. So thoughtful! Thanks for the insight! I'm doing all my work in Iray, so I'll be converting stuff as I go. Luckily, the Uber conversion is relatively decent. Most of what I end up doing is changing metal, glass, and liquid to MEC4D's shaders and leaving most of the painted textures alone. Quick Iray render of the docks, just changed out the water and glass. That looks pretty good. Going to have to dig it out soon and give it a try. Today's experiment was with storm clouds and lightning in Vue. Rain, clouds and lighting in Vue. 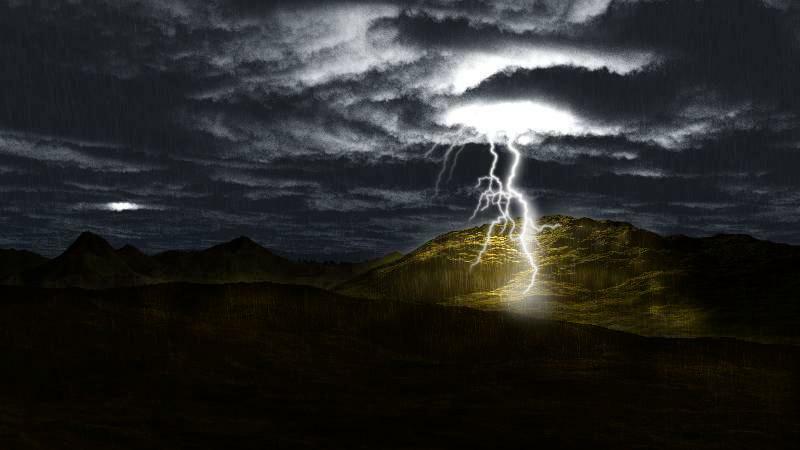 The bolt itself is in Photoshop, using Ron's brushes. Also used layer masking and different exposure layers to get the ground lighting. I haven't used his water brushes. I picked up the waterfall set in a recent sale, but haven't had a chance to use it yet. I've had pretty good luck with his smoke and fog, using size and angle jitter and about 5-10% opacity. Change brightness every so often,and use the same brushes with the eraser as well. Looks really good! The water brushes have a bit of a learning curve for sure. Still working on that myself. Mostly, I start with a darker grey or blue or whatever color the water is and work my way down in lightness, experimenting with sizing down or moving the brush a hair to the side or above or below the first stroke and lots of experimenting with brush angles and opacity. I erase a lot lol. Cool. I'll have to give that a try. I love those clouds- so much intensity and you can feel that they're really charged up! Very nicely done. Thanks! I actually think the DAZ ToS compliant one came out better, primarily due to different tweaks in postwork. My renders always look slightly different (usually darker) once they've been uploaded - maybe due to file compression? Kewl! Very good lighting. 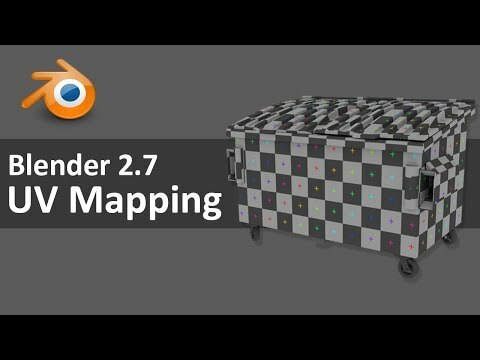 Do you model in Blender? Wondering how you like it if so. Are the candle flames objects or FX? They're both lovely. What were the differences in postworK? I have found that some images I've done look darker once posted, too, than what the original is. I have no idea why that is. I do model in Blender. I've done a few things, mostly jewelry (rings and necklaces). Once you get past the initial learning hurdle (it's not even a curve, it's more like a 90 degree bend) I think it's realtively easy to use. But that initial step is tough. There are a couple of good video tutorials out there that can help a lot. You also have to get used to keyboard shortcuts. Luckily you don't need to memorize more than a few. Once you start going with it, there's so much you can do with it. I use the rigid body physics engine to drape necklaces and chains to get some nice effects. The pearl necklace in the render below came out of blender. As for your other question, the candle flames in the render are actually part of the object, set to an emissive shader. The main difference in the postwork tweaks were slight adjustments in lighting and exposure. I think I had more rim lighting in the one here on Daz. Also some postwork to highlight the eyes and hair that I didn't do in the one on DA. Thanks that neclace looks great... very good draping. The votive candleholder is now on sharecg and is linked in the Freebies section in the forum. Oh... BTW... I've had Blender for quite awhile but have never cranked it up yet. Playing catch-up in learning more in Carrara this past year finally setting up scenes and creating more models. Note that no matter what modeling program anyone uses they are always welcome in my Modeling Objects in Carrara - Q&A - Come One and All thread... modeling is modeling. Speaking of jewelry... that is one thing I've been planning on learning... but keep getting sidetracked by other models. Today's experiment is one around creating complete content - modeling, creating UV maps, creating surfaces, texturing, and rigging. 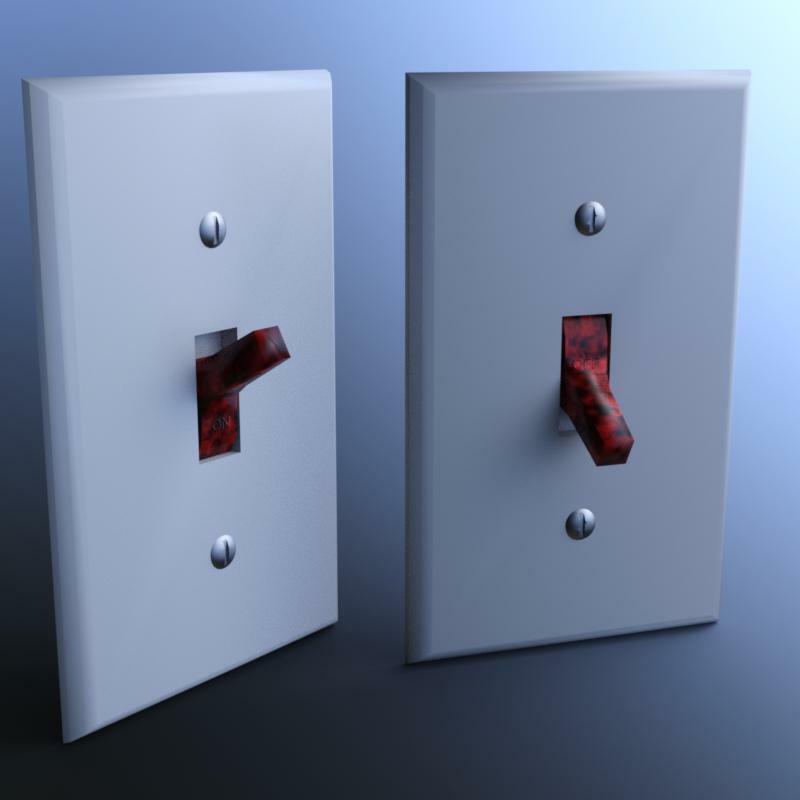 The render content is fairly simple - a light switch and wallplate. Created the mesh in blender. Discovered that boolean operations can cause weird things to mesh geometry when I created the hole in the center of the plate. Had to do some vertex and edge editing to clean it all up. The screws are actually flattened spheres on which I used a boolean subtraction to carve out the slot in the head. The switch itself was the hard part - getting the geometry right (which is still not all that good). 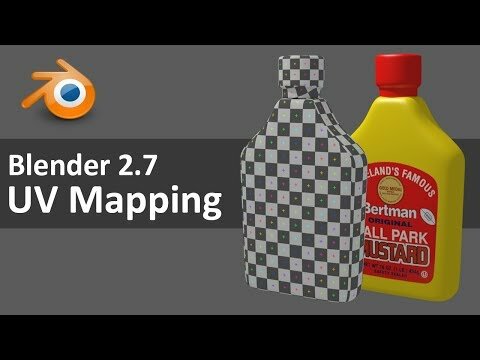 Then set about creating the UV maps in blender. Found some good tutorial videos on YouTube. Unwrapped the switch itself. Didn't bother with UV maps for the wallplate or screws. 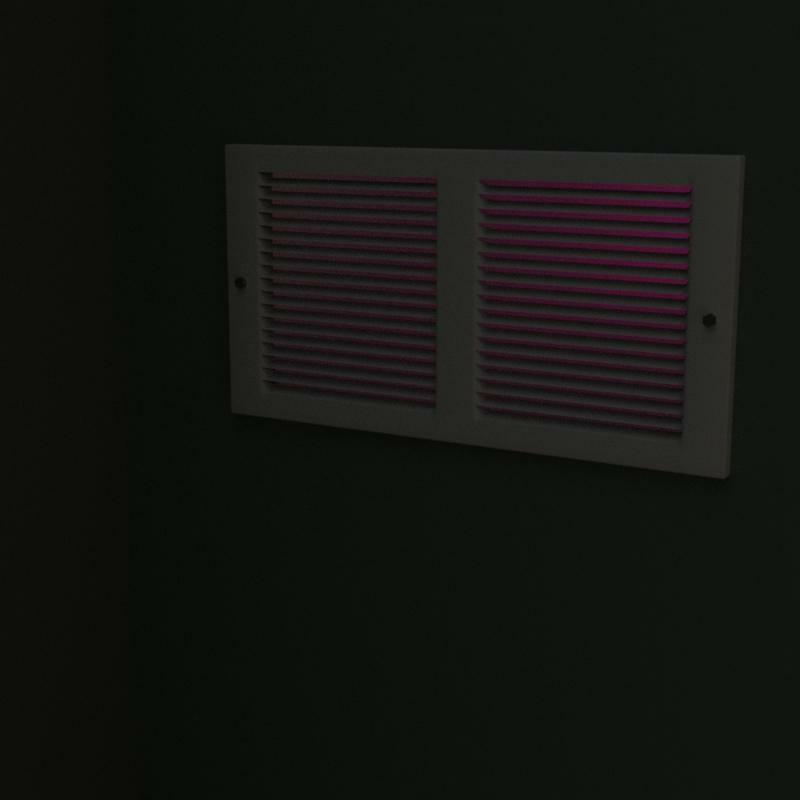 Using the exported UV Maps, went into Photoshop and created both the diffuse texture (using FilterForge) and the bump map for the "ON" and "OFF" imprints on the switch. Then, following SickleYield's rigging tutorial on DA, rigged the mesh so that the switch can be set to the on/off positions and the screws can rotate.